Creating and sending quotes has never been easier! Save time by using our Bulk Upload tool to create multiple quotes at once, as well as automatically send those quotes to specific network partners. If you prefer a personal walk-through of this feature, please reach out to your account rep or customer service. Click the blue Create+ button. The template will download as a Microsoft Excel file. Open and enter quote data within the Bulk Upload template. Please note: When bulk uploading LTL quotes, the My Role and Payment Directions columns are required to provide accurate automated LTL rates. Instead of typing out the entire origin or destination address, you can now use a Location ID from your address book! Open the Bulk Upload template. Navigate to your Address Book. Open the specific location you will be using within the bulk upload. Copy the Location ID located under the company name of the specific location. Paste the Location ID within the Origin Location ID (column N) or Destination Location ID (column AB). Save the completed template to your computer. Within the Emerge platform, click ADD DOCUMENT. Locate the completed template within your local files and click Open. Once template is uploaded, click SUBMIT. 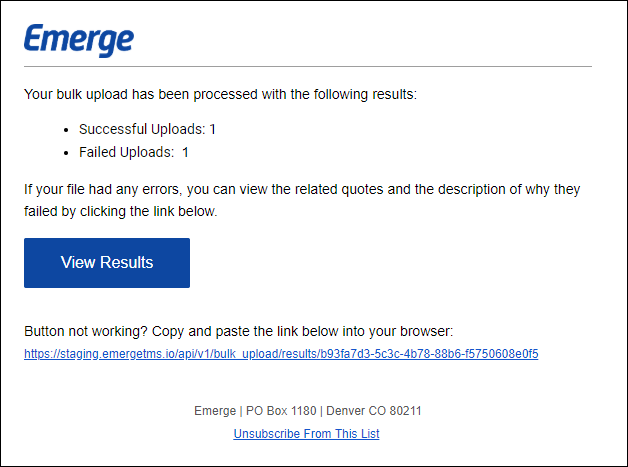 Once the document has been uploaded, you will receive an email from Emerge explaining if the quotes were uploaded successfully or if there are errors that need to be addressed. Upon downloading and opening the results file, you will see three additional columns. Quote ID: If your quotes were successfully uploaded, you will see quote numbers in this column. Requests Sent: Shows the total amount of network partners who received the quote. Errors: This column contains a description of the error preventing the quote from being sent. Please reach out to customer support so we can provide further assistance.